What are all of the new features in Cook'n X3? I watched the Cook'n X3 video about the new Capture Plugin and I want it! How do I get it? Cook'n fails to launch. How do I fix this so I can access my recipes? How do I sync? What is this Membership Service? Do I really have to pay to sync and capture recipes? I have sent multiple messages to support with no reply. Why don't you respond? How can I get Cook'n and all my recipes from my old computer to my new computer? What is the best/fastest way to learn how to use Cook'n? How can I add my photo to Cook'n? How do I sign up for a Membership Plan? Now that I am a Premium subscriber, how do I use my credits to redeem free cookbooks? There has been a mistake with my billing. How do I get this resolved? How do I update my credit card/debit card information? I can't seem to remember my password. How can I log in? How do I change my Cook'n Cloud e-mail address? Sync fails with this error message: "[!AccountServiceResponseKey.DEVICE_REGISTRATION_FAILED] OR DEVICE_REGISTRATION_FAILED_ACCOUNT_NOT_INITIALIZED." Why? The recipes are not syncing correctly between my computers and devices. I'm not getting all of my recipes to go through. How do I fix this? Sync fails with a "Not Responding" message. Why? I keep getting a Sync Error. How can I fix it? I'm getting a "LocalHost:5918 Error" or a "404 Error." What can I do? The latest Cook'n update failed. How do I fix this? Why are there so many ads in Cook'n? Why does the Live Recipe Feed on my Mac say "Plugin Blocked?" Do you have tutorial videos that I can watch to learn how to use Cook'n? I get no search results...ever. Why? How do I add websites to the Live Recipe Feed Preferences? Cook'n on my Mac crashes with this message: "Cook'n quit unexpectedly..." Why? Why don't my pictures show up when I print my recipes? My Recipes are gone! How to I get them back? How can I capture my Pinterest recipes? Where can I find video demonstrations to help with me with Cook'n? Right here! Newest videos are at the top. To receive your free cookbooks each month, launch the Cook'n Desktop App and make sure that you are logged in to the Cook'n Cloud Account associated with your Premium subscription. Then, simply click the "Credits: 1" link at the top of the Home Page. Watch this demo video for more information. Note: if Cook'n is already running, please exit and restart so it will detect your new Premium Membership status. We respond to all e-mails. If you are not getting our responses it is probably because our messages to you are getting filtered. Please check your spam folder. We usually respond to all e-mails in 24 hours or less except on weekends. We do not work on Saturday or Sunday. 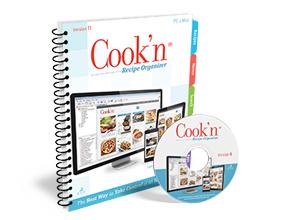 The easiest way to transfer Cook'n and your recipes to your new computer is to Install Cook'n on your new computer by clicking to www.dvo.com and, under step 2, you will see a "Download Cook'n for PC" button and a "Download Cook'n for Mac" button. Click one of those two buttons. Then, simply log in to your Cook'n Cloud account to get your recipes back. If you already have a Cook'n Cloud account, you may need to logout before you find the Cook'n Download button. The best and funnest way to learn how to use Cook'n and take advantage of the powerful features in Cook'n is to click here to watch some of the demo videos. They're super fun! The first thing you should try is a re-install. The easiest way to re-install Cook'n is to click to www.dvo.com and under step 2, you will see a "Download Cook'n for PC" button and a "Download Cook'n for Mac" button. Click one of those two buttons. Also, please note that if you qualify to use Cook'n X3, then once you have signed-in to your Cook'n Cloud account and re-launched the program, an orange button will appear on your toolbar offering to upgrade you to Cook'n X3 for free. After this, if you still have trouble, please contact support and we will be happy to help you. There may be a number of reasons why Cook'n fails to launch on your computer. Here are some steps you can take to fix this and get Cook'n going again! When you launch Cook'n, it first checks to see if Cook'n is already running. If so, it will not launch a second instance otherwise that would cause problems. Sometimes, people don't realize that there is an instance of Cook'n already running. So...let's not make this more difficult than it needs to be. Simply restart your computer and try again. It could be that you are trying to launch Cook'n from a Windows User Account that does not have Administrator privileges. To solve this, simply right click on the Cook'n icon and choose "Launch as Administrator." Cook'n Version 10 and Version 11 were released 5 or 6 years ago. A lot has happened since then. Microsoft and Apple have both released new versions of their operating system. Cook'n Version X3 is optimized for the newest operating systems. If your old version of Cook'n fails to launch, this might be a good time to consider upgrading. For a limited time, you can click here to upgrade to Cook'n X3 for only $4.95 (regularly $64). This is a fantastic deal. If you have the latest version of Cook'n and it won't launch, it is possible that your installation of Cook'n has become corrupt. Re-installing Cook'n may fix your problem. One easy way to do this is to click to www.dvo.com and, under step 2, you will see a "Download Cook'n for PC" button and a "Download Cook'n for Mac" button. Click one of those two buttons to install Cook'n for free. If the app launches successfully, then we know that the launching problem has something to do with your recipe database. The next step is to simply click File->Restore->From Cloud Account to restore your recipes from your Cloud account or click File->Restore->From File System and select a recent/large backup file from the Documents\Cook'n Backups folder. How do I sync? What is this new Membership Service? Do I really have to pay to sync and capture recipes? Yes. This happened because computer software industry has shifted. If you take a look at Best Buy or Walmart or Sam's Club or Costco or Office Max or any retailer for that matter and you will see that they don't even have a software department in their stores anymore! Everything has gone mobile. And, software companies have all moved to a SaaS Business Model (Software as a Service). We made a similar change. We sent several e-mail messages announcing this service in April, 2016. You can click here to read all about the new Membership Service and see answers to frequently asked questions. The bottom line is: you can keep using the Cook'n product that you purchased forever without paying anything more. We're only charging for services. Services like Cloud Storage & Sync services, tech support services, and other web services like Capture and Scan, and upgrades are available to subscribers only. We simply cannot afford to offer these services for free. For example, we must pay a fee each month to store your recipe data in the cloud and all those food photos take up a lot of space! We must pay for every read and write operation too which means that every time you sync to the Cloud, it costs us money. This is a cost that we didn't have a few years ago and every month, these Cloud costs grow higher and higher. This is not a land grab. We're not screwing the general public. Kathy and I have literally put everything on the line. We spent everything we have and more to provide something amazing to our customers...and we have delivered. Cook'n is really amazing and it works great. There's no other kitchen tool quite like it. We hope our customers will value that and subscribe. In fact, we've bet the farm on it! The good news is that you can subscribe to one of the membership plans for as low as $4.95 per month. This new business model is more affordable than the last! In the past, Cook'n users had to pay $64.95 to get the newest Cook'n upgrade...but now members can get upgrades for only $4.95 per month! Sign up today and join with us as we move forward into a new era of Cook'n!! How do I import a .dvo cookbook or recipe file? Before you begin, please make sure you have the latest version of Cook'n. And, if you haven't already done so, please install the necessary Plugins. This may happen if you are running Cook'n on an old version of the Mac Operating System. For example, if you are running Mac OS 10.6.8 (Snow Leopard), you may encounter problems like this. To solve this, upgrade your operating system. It's free! There are NO ads in Cook'n. That is to say, DVO does not generate any revenue by selling advertisements. However, recipe websites have ads and if you visit those sites, you will see their ads...but those are their ads not ours. And, there is no way for us to remove them. We cannot control the content on those websites. I'm getting a "Local Host:5918 Error" or a "404 Error." What can I do? The first thing you should try is a re-install. The easiest way to re-install Cook'n is to click to www.dvo.com and under step 2, you will see a "Download Cook'n for PC" button and a "Download Cook'n for Mac" button. Click one of those two buttons. If you are signed-on to your Cook'n Cloud account, logoff to access the download button. Please note that if you qualify to use Cook'n X3, then once you have signed-in to your Cook'n Cloud account and re-launched the program, an orange button will appear on your toolbar offering to upgrade you to Cook'n X3 for free. If re-installing the program doesn’t fix the problem, the "localhost:5918" error is most often associated with your computer's firewall or anti-virus software. Cook'n requires an internet connection to browse and display internet recipes, so if the program is being blocked, Cook'n will not function properly. To resolve this, check your firewall's list of approved programs to put Cook'n on your Exceptions list and approved for the network that you're connected to. You may also want to check that your anti-virus software is not blocking Cook'n from accessing the internet. To fix this, launch Safari on your Mac and click here to update Adobe Flash Player. This problem seems to occur for those who have Cook'n Version 10. Cook'n 10 is about 8 years old. The solution to this problem is to upgrade Cook'n. Note: Cook'n upgrades normally cost $64. But, you can upgrade for a one-time fee of only $4.95. To be clear, you must sign up for one of the Cook'n Membership Plans to get the upgrade. And, the Cook'n Membership Plans are a monthly subscription service. But, you can unsubscribe at any time. So, if you sign up for the Basic Membership Plan, for example, for only $4.95 and unsubscribe at any time in the next 30 days, you can get the upgrade for a one time fee of $4.95. Simply click here and sign up today while this deal lasts!). First, we need to figure out which device is not syncing properly. 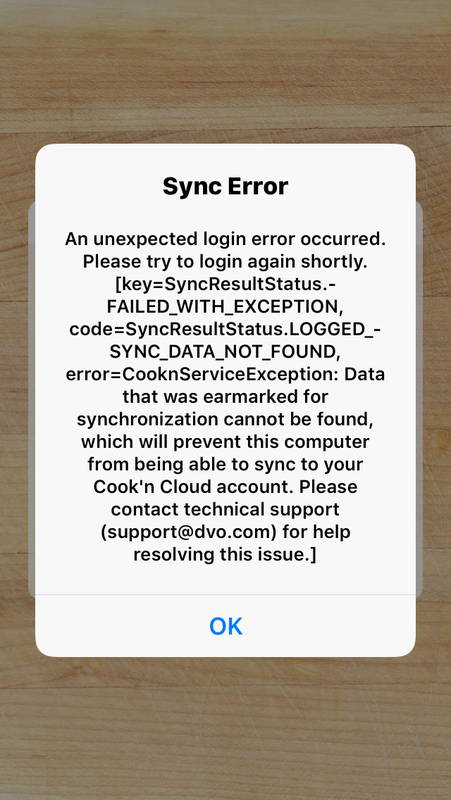 To do this, go to www.dvo.com/login.php to log in to your Cook'n Cloud account. Click around and check to see if all of your recipes are there. If you have recipes on Device A that do not appear in your Cook'n Cloud account, click Sync and check again. If you still do not see them in your Cloud account that indicates that the recipes are not getting from Device A to your Cloud account. On the other hand, if you see recipes in your Cloud account that do not appear on Device B, click Sync on Device B and check again. If you still do not see them on Device B, that indicates that the recipes are not getting from the Cloud to Device B. If the device that is having trouble syncing is a mobile device, the easiest thing to do at that point is to simply remove the app from your device, re-install it again, and then log in to your Cook'n Cloud account. If you have recipes on that device that do not exist in your Cook'n Cloud account, you may want to e-mail them to yourself before you remove the app so you can import them again later. Sync fails with this error message: "[!AccountServiceResponseKey.DEVICE_REGISTRATION_FAILED] OR [DEVICE_REGISTRATION_FAILED_ACCOUNT_NOT_INITIALIZED]." Why? Go back to Cook'n and click "Continue," at which point, all of your recipes will be uploaded to your new Cook'n Cloud Account. The uploading of your recipes completes the initialization process. This error message indicates that step 2 or 3 was skipped. Consequently, you can't log in to this account from another device and download recipes because the recipes were never uploaded to your account in the first place. To resolve this, find the confirmation e-mail and click the link to confirm your account and then return to Cook'n and click the "Continue" button to upload all of your recipes to your Cloud account. Or, simply simply contact support and ask us to wipe your account so you can re-create it and start over. If I download the upgrade version of Cook'n X3, do I need to keep my old version installed? Only if you want Cook'n to upgrade your recipe data. Once your recipe data has been upgraded and appears in the latest version of Cook'n, you can delete old versions of Cook'n. First, make sure you have Cook'n X3 installed on both machines. Then, simply create a Cook'n Cloud account on one computer and log into that account from the other. Your recipes will transfer automatically. Alternatively, you can run Cook'n on one computer and click File->Backup. This will create a backup file. Transfer the backup file from one computer to the other computer via a network or e-mail, or by using a jump drive or CD/DVD. Once the backup file is on your new computer, run Cook'n and click File->Restore->From File System. Cook'n makes a backup of your recipe database files automatically from time to time. These backup files are saved, by default, into the Documents\Cook'n Backups folder (however, since this location is customizable, check the Options->Preferences dialog to verify). To restore a backup file, simply run Cook'n, click File->Restore->From File System, and choose the most recent backup file. Please note, once you've restored a backup file, you will be automatically disconnected from your Cook'n Cloud account. If you want to use this new file with your membership benefits, please contact support and ask them to wipe your Cook'n Cloud account so you can re-upload your data. Analyzing nutritional values can seem complicated at first. The easiest way to master this powerful aspect of Cook'n is to watch the video demonstration. The Nutritional Analysis Explained video demonstration will review this feature in much more detail. Click Print button on the toolbar. To get your food photos to appear when you print your recipes, simply click the Settings button in the Print Preview screen and make sure the "Print Images" check-box is checked. I get no search results...Why? Cook'n Version 10 came out about 6 years ago. Since then, the service provider that we use for Internet Search results changed their service which broke this feature. The best way to solve this is to upgrade to Cook'n X3. Note: In the past, major upgrades cost $64 but now, upgrades are one of the benefits of Membership. Simply click here and sign up today while this deal lasts! Alternatively, you can follow the work-around steps below. Use a browser (such as Chrome or Firefox) to search for recipes and when you find a good one, copy the web address and paste it into Cook'n. At that point, you can click the Capture button to save it. Sometimes members get double billed when they click "subscribe" multiple times before the next page loads. Along with this, there are other problems that might arise with billing. For all inquiries, please email barbara@dvo.com for assistance. The easiest and most secure way to update your credit card information is through your Cook'n program. Launch Cook'n, and from the homepage, click My Account. Scroll down until you find your billing information, and then click Update. This message may occur on your PC or Mac desktop computer. Or, it may occur on your phone or tablet. If this error appears on your PC or Mac, you may need to resolve the problem in a couple of phases. First, click File->Restore->From Cloud Account to restore your data from your Cook'n Cloud account. If that doesn't resolve the problem, exit Cook'n and launch File Explorer (for PC) or Finder (for Mac). Navigate to Documents -> Cook'n12 -> workspace. Once there, highlight your "data" folder and rename it to "data-old," and then try syncing again. To resolve this, simply delete the app from your mobile device, then reinstall it and sign in. This problem occurs when Cook'n tries to sync data that cannot be found in your database; that is why the message says "Data that was earmarked for synchronization cannot be found." NOTICE: If you've encountered this problem repeatedly, this might be a good opportunity for you to earn $100! This problem is very rare. However, it does still occur on occasion for a handful of people. And, we want to fix it. But, we cannot fix it until we can reproduce it. Therefore, if you can give us steps to reproduce this error, we will give you $100. Do this, that and the other (be specific here). For example, Search for "chicken soup," Capture the recipe from www.somewebsite.com, Delete the recipe that was just captured, etc. If you can give us steps like this that we can follow to reproduce the problem, we will happily give you $100. Good luck! Tips: As mentioned above, this problem occurs when Cook'n tries to sync data that cannot be found in your database. So, for this condition to exist, you must somehow add data to your database (for example, capture a recipe, type in a recipe, create a new cookbook or chapter, etc.) then you must somehow remove that data from your database before the next sync operation (delete the cookbook, chapter, or recipe, or move a recipe from one chapter to another, etc. ).